Today's notion of romance goes something like this: Julia Roberts or Meg Ryan (or, possibly, Sandra Bullock if neither of the other two are available) receives a mis-routed, anonymous e-mail from a sensitive, misunderstood espresso bar proprietor who is searching for his soul mate to help him raise his darling little nephew who he adopted when his sister died in a tragic plane crash. So, Julia or Meg (or possibly Sandra) spends the next two hours trying to find this perfect man until she realizes that the guy who comes into her neighborhood Post Office every Friday to send cookies to the Angolan refugees is the same man who wrote the letter. He's played by Tom Hanks or Hugh Grant (or, possibly, Harrison Ford if the movie includes machine guns or jet aircraft at any point). Today's stories of unrequited romance have their roots in the medieval concept of "courtly love." This idea began in the mid-12th century when Eleanor of Aquitaine gathered the influential young women of Europe to her palace in Gascony for what was, in essence, a 20-year-long bridal shower—which, like most of events of this type, involved a lot of starry-eyed young women sitting around daydreaming about boys. As news of Eleanor's court of lovesick young heiresses spread, every knight from León to Liechtenstein—including the Crown Prince of England—came to Gascony in the hopes of impressing this band of giggling air-heads with some feat of gallantry. Of course, any attempt to actually perform a feat of gallantry resulted in all the knights dog-piling on top of each other, punching, spitting and calling names, as the ladies ran off, shrieking and giggling, to another corner of the barony. Finally the King of France, who was angry at being disturbed from his peaceful dinner by a bunch of rowdy kids, put a stop to things by storming into Gascony and shouting, "Young ladies! Is this how I taught you to behave? And if you boys can't come up with something constructive to do, I can find a Crusade for you to fight!" So, the knights and ladies returned to their daily routines of whipping their servants and starting civil wars. But the poems and tales of courtly love told in Eleanor's court quickly spread throughout Europe, bringing the ideal of gentle dalliance and graceful courtship to a culture which, until then, had regarded the concept of "romance" with the same degree of sentiment as we reserve today for things like bank mergers. 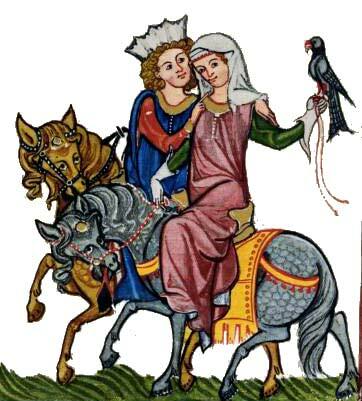 Even in the 21st century, medieval tales of courtly love remind us that passion can reach higher than lust, that true love can overcome any obstacle, and that it is possible, even after being yelled at by the King of France, to fall in love with an e-mail message. In this month's column, Eleanor of Aquitaine was played by Julia Roberts, Henry Plantaganet was Hugh Grant, and the King of France was Rodney Dangerfield. Sir Guillaume intended to produce thorough documentation for this article, but was unable to complete the necessary research when he became unexpectedly ill after "gallantly" attempting to drink a latté from his wife's shoe. Guillaume's column "I Didn't Expect An Inquisition" appears monthly in the SCA newsletter "The Crown Prints." Sir Guillaume is a member of the Society for Creative Anachronism, where he is a knight, Pelican and baron, much to the dismay of the other members of those orders. His column, "I Didn't Expect An Inquisition," which appears monthly in The Crown Prints, has received several awards and was once described as "completely devoid of social value." If you want to add this article to your list of favorites or email it to a friend, please use this permanent URL, https://stores.renstore.com/-strse-template/0602A/Page.bok. Permission is granted by the author to quote from this page or use it in handouts as long as you include a link back to Renstore.com.